Ask most people where Tampere is, the majority of people might struggle. Despite being Finland's third biggest city, it is not a place that is well-known beyond the borders of the Scandinavian country. However, three years ago, Tampere United were ejected from the Finnish league after they were connected with strange payments from Singapore. Fixing and fraud in sport has become intricately linked with the city's name. Three weeks ago, the city hosted a Challenger tennis tournament. David Goffin would win the Tampere Open to wrap up his third consecutive title, but my interest in the tournament was piqued earlier this week by a response on Twitter to my article on the Boy Westerhof against Antal van der Duim match. It made me wonder whether anything might show up to support this claim if I looked back at the tournament through the Betfair data. Going into this research with no preconceived ideas or suspicions, I was quite interested to see what the data might show. Once I had extracted the relevant data from the huge file that Betfair provides, the first step was to look at the total amount staked on the first round matches. The table shows the sixteen first round matches with the total number of bets placed on each match and the total amount matched on the four markets for each match. All the data is for pre-match only. The average amount matched across the sixteen matches was £3,723, but if the top two matches are excluded, this average drops to just £1,186. The top two matches - Damir Dzumhur against Herkko Pollanen and Antal van der Duim against Elias Ymer - both saw amounts significantly above the average matched. The van der Duim against Ymer match in particular is interesting, given the 623 matched bets - almost five times more than the next most bet on match. 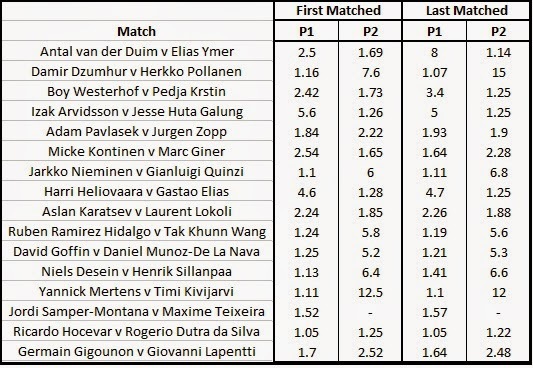 The next thing that I took a look at was the first matched and the last matched pre-match prices for each of the sixteen first round matches. A couple of matches catch the eye here. We can see that there was an enormous pre-match move on the van der Duim against Ymer match. Elias Ymer was first matched at 1.69 with van der Duim being matched at 2.5. By the time the match started, we can see that the price on Ymer has collapsed to the point where the final matched bet was at just 1.14. Another match that saw a huge price move was that between Boy Westerhof and Pedja Krstin. Krstin was first matched at 1.73 and Westerhof at 2.42, but by the time the match started, Krstin's price had collapsed in just 1.25 with the Dutchman having drifted significantly out to 3.4. Several other matches saw big moves as well. In both the Kontinen against Giner match and the Pavlasek against Zopp match, we saw a switch in favourite, while Niels Desein drifted significantly having started as a very strong favourite. As an aside, it is slightly sad to note that not a single bet was matched on Maxime Teixeira to beat Jordi Samper-Montana in his first round match. It is important to remember thought that a big move in price does not necessarily signify anything untoward. It could simply be that the initial prices were incorrect. However, it is something that we may wish to bear in mind. We can continue to drill down into the Betfair data and break down the overall matched amounts by the market that it was matched on. Things become quite interesting here. As we might expect, the majority of matches see the most money matched on the match winner market. However, one match stands out in this respect - the match between Boy Westerhof and Pedja Krstin. Here, we saw £986.20 matched on the Match Winner market, but a huge £2,540.02 matched on the Set Correct Score market. Interestingly, every penny of this was matched on the Krstin 2-0 scoreline, which was backed in from 2.14 into 1.71, mirroring the move in the match price. The other match that saw a significant amount matched on the Set Correct Score market was the Antal van der Duim against Elias Ymer match, which saw no fewer than 67 bets on the market and a total of £3,243.98 matched. Of this, just £10.06 was matched on any result other than the Ymer 2-0, which was backed in from 2.16 into 1.3 before the start of the match, again mirroring the dramatic move in the match prices. The other intriguing markets were the Set 1 and the Set 2 Winner markets in the Antal van der Duim against Elias Ymer match. The other fifteen first round matches saw a total of 38 bets on the Set 1 Winner market compared to 99 for this match, and just 4 bets on the Set 2 Winner market compared to 33 for this match. So, how do these matches fit in compared to the rest of the tournament? 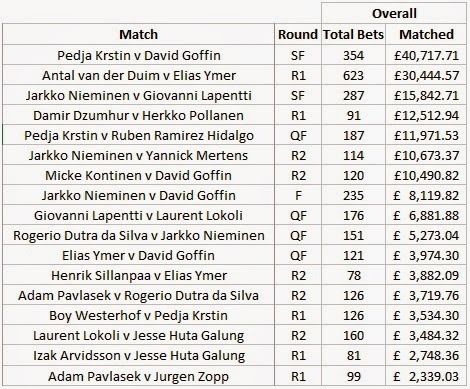 We find that the Antal van der Duim first round match was second on the list, seeing around £10,000 less matched than the tournament's most bet on match - the semi-final between Pedja Krstin and David Goffin. Looking slightly closer at the money in this match, we see the vast majority matched on David Goffin in the Match Winner market at odds between 1.09 and 1.13. Having seen where the money went and which markets saw the big gambles, how did these market movers perform? The big movers in the market were successful. Elias Ymer and the 2-0 correct scoreline comfortably won with van der Duim winning just two games in the match. Similarly, Pedja Krstin and the 2-0 correct scoreline also won comfortably with the Serbian dropping just five games. Micke Kontinen won in a tough three set match after his move into favouritism, while Jurgen Zopp was unable to justify the market faith in him as he lost in straight sets to Adam Pavlasek. 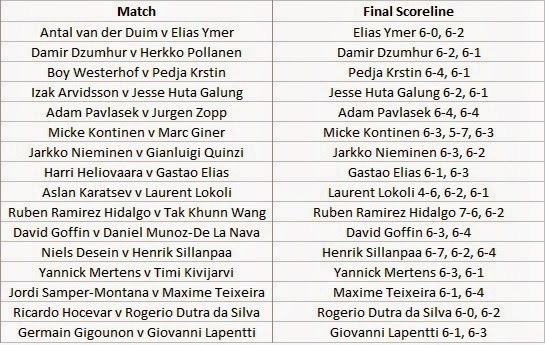 Niels Desein lost in three sets to Henrik Sillanpaa after his drift, while Maxime Teixeira actually won, despite not a penny being matched on him before the start. So, we return to our initial question of whether there was any suspicion surrounding any matches during this tournament. The amount of money matched and quantity of bets on the Antal van der Duim against Elias Ymer match, particularly on all four of the side markets is unusual. There could be question marks around the amount matched on the Set Correct Score market in the Boy Westerhof against Pedja Krstin match. However, this is not aimed at singling out those players. There was almost £2,400 staked on the Set 1 and Set 2 Winner markets in the Pedja Krstin against Ruben Ramirez Hidalgo quarter-final match. There was over £1,300 matched on the Set Correct Score market in the Micke Kontinen against David Goffin second round match. Simply because there is plenty of money matched on a side market does not immediately mean there is anything suspicious. It could simply be that someone has a strong feeling on that match. It could be that a big-money punter merely fancies getting involved. However, given the recent events, it is worth bearing in mind that there could be something more sinister behind this money. Are those matches 'dodgy'? We cannot conclusively say that they are. However, given the unusual betting patterns on these matches, particularly compared to the rest of the first round matches, we cannot conclusively say that there is nothing suspicious about these matches. 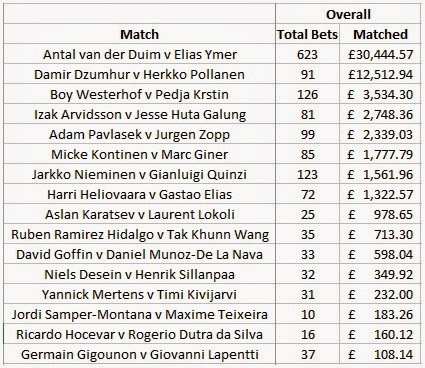 After watching the Boy Westerhof - Duim match on betfair there are not the slightest doubt in my mind, that matchfixing occour in lower ranking tournaments. So this brought the Tampere Tournament to my attention as well. Numbers never lie!. And given the recent betting patterns i find it hard to believe that, its a pure coincident! But these cases are almost imposible to prove! Unless you find a direct/indirect link from the money, to the involved players!